Inspired by traditional folk offerings, Casey Benjamin designed this charm to heal broken hearts. Two-time cancer survivor Casey Benjamin believes that the jewelry you wear every day can bring "good juju" into your world. 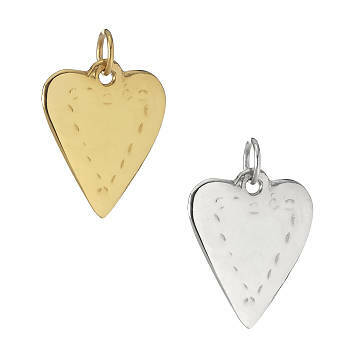 Like this heart-shaped "milagro" charm based on ritual folk offerings traditionally given across the Americas. Spanish for "miracle," milagros are representational forms cut from metal. Wearing one in the shape of a body part is thought to bring healing to that area. Charm: 3/4 L x 7/8" W Chain: 18"